STURGIS, S.D. -- I was in the Broken Spoke Saloon writing down an observation in my notebook when a buxom blonde woman wearing a zebra-print thong bikini sat down next to me and slapped a wad of money on the table. "I just made almost enough money to pay for a new Dyno on my motorcycle," Sally Middleton said. "My girlfriend and I were dancing on top of bars downtown. We've never done that before but I thought, 'What the hell, why not?' I danced 10 minutes and made $80." Eighty dollars in 10 minutes? That's almost $500 an hour. Obviously, Scott Boras is representing the wrong people. "Yeah, $80 in 10 minutes," Middleton said, sorting out the ones and fives. "I think that's the s---. Don't you think that's the s---?" Women in zebra-striped bikinis are commonplace on the streets of Sturgis. After I agreed that, Yes, that is the s---, Middleton informed me that she is a chemist for a power plant in Topeka, Kan., swore again that she and her friend, Brenda Page, had never ever danced on a bar before nor dressed this way in public and insisted that I follow her outside to look at the motorcycle she built in her garage. The next thing I knew, I was leaving a bar with two women who were wearing thong bikinis. Let me assure you, this was a career first. Sure enough, her motorcycle was impressive -- a glimmering, powerful beast with a license plate that read 2QK4U and a tail light in the shape of a skull. I complimented Middleton on her work and said the skull was an especially nice touch. "I think so, too," she said, walking away. "And when it goes on, it looks like flames are shooting out of his mouth." Like I said, nothing like this has ever happened to me before, but then again, I had never been to the Black Hills Motorcycle Rally before, either. 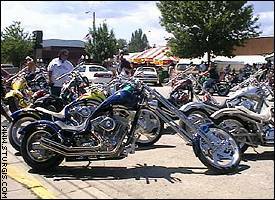 Around a half-million bikers will roll into Sturgis this week for the Black Hills Rally. Now in its 62nd year, Sturgis is the most famous motorcycle rally in the country, with this little town of around 5,500 being host to upward of 500,000 bikers over the course of nine days each August. All event publicists are notorious for inflating attendance figures, but I don't doubt the accuracy of the 500,000 estimate, because every single one of them was revving his or her engine outside my hotel window this morning! In fact, I can still hear several, which is truly remarkable considering that I left Sturgis several hours ago and am writing this from my motel room in Murdo, which is 170 miles and another time zone to the east. All remaining interviews on my 17-day drive across Interstate 90 no doubt will be limited to me asking questions and shouting, "what!?!?" to the answers. But I'm not complaining. 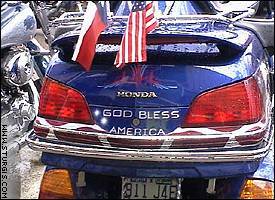 Driving 1,000 miles to the world's most famous motorcycle rally and complaining about the noise is like flying to Paris and complaining that the people speak French. How big is the Sturgis rally? I can write down 500,000 bikers, but I cannot begin to adequately describe how truly immense this rally is. The Buffalo Chip campground has an estimated 25,000 bikers staying there and is so big that it has its own Taco Bell, A&W and Subway shops, plus a concert stage (Blues Traveler played Thursday night). And that's just one of several surrounding campgrounds overrun by bikers. All the motels within 70 miles are full as well -- I paid $295 to stay at the Sturgis Best Western, yes the Best Western! -- and local residents not only rent out their homes for as much as $5,000-$6,000, they rent out their lawns for tent sites at up to $30 a space. There are so many motorcycles -- almost all Harleys -- parked one next to each other on Main Street that someone erected a temporary tower so people can fit the entire scene into the camera frame. It costs $5 to go up the tower, and there was a steady stream of bikers with cameras climbing up the stairs when I walked past. People literally come from around the globe to attend the rally. The rally headquarters has a map of the world with pushpins signifying where all the registered bikers are from. I noticed a man listed Kansk, Siberia, as his hometown, which seemed like a very impressive distance -- imagine, all the way from Siberia! -- but then I saw that someone had pushed a pin into October Revolution Island, which not only is 3,000 miles north of Kansk but 400 miles north of the Russian mainland as well. 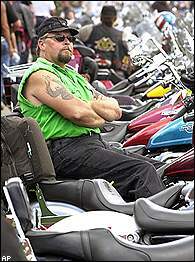 And all the bikers -- and I mean all -- wear leather and tattoos (there are more tattoos than at the NBA draft). Just in case the bikers run out, the streets are lined with tattoo parlors and stores selling everything from leather chaps to leather underwear. It's like the Castro District on Gay Pride Day, only with more spit tobacco ads. "A lot of cows died for the cause," said Tyson Higgenbotham, a publisher from Columbus, Ohio. This is a point that does not elude PETA's Lisa Franzetta, who walked around downtown in a most sensual faux leather halter top and bottom to draw attention to the assortment of simulated leather gear available. She is a very attractive woman with a great figure, and if she wasn't winning converts to her cause, she was at least getting a lot of people to momentarily consider her point of view. The Sturgis rally is a true slice of Americana. Unfortunately, not many bikers shared Franzetta's figure but nonetheless aren't shy about showing what they have anyway. Not to say there are a lot of sagging breasts here, but looking at some of these bikers must be like seeing Phil Mickelson in leather and chaps. How big is the Sturgis rally? Consider the Full Throttle saloon, billed as the world's largest biker bar, and truly the place to go if you think the waitresses at Hooters dress a little too conservatively. The Full Throttle is a couple of miles out of town, and you know the final scene of "Field of Dreams," when there is a seemingly endless string of headlights approaching the baseball diamond? That's what the road to Full Throttle is like. The bar is so big and so popular that traffic backs up bumper to bumper two miles to its entrance. The dirt parking lot is sufficiently large enough for a football stadium, and when I finally drove in, there were men with little bulldozers clearing mud to make more room for parking. That doesn't adequately describe the Full Throttle, but it's a start. I mean, there are booths selling knives and actual animal skins (where was PETA's Lisa Franzetta, anyway?). And the really amazing thing is it's a temporary structure. A crew comes in a couple of weeks before the rally and sets it up, then tears it down the day after the rally ends. 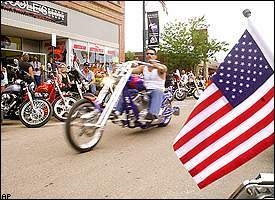 The main street in Sturgis is dominated by an event that lasts for one week a year. Back downtown, Sturgis has an almost state fair feel to it. There are concession stands selling roasted corn and buffalo burgers (a Sioux organization runs the latter), vendors hawking their wares and various people pushing their causes. There is even a carnival show called the Wall of Death. This is a 16-foot high, 30-foot diameter wood-planked barrel -- or motor drome -- in which motorcyclists ride around on the vertical walls, held up by nothing more than centrifugal force and guts. It's quite a sight. Racing at speeds up to 45 mph, they zoom up and down the walls, first singly and then two riders at the same time. I was a little skeptical when I bought my ticket, but by the time Sunny Pelaquin slowly edged up to fellow cyclist Jay Lightnin, touched him on the shoulder and then sped past him while both continued driving horizontally on a vertical wall, I became convinced that there could be no wilder or more dangerous act that anyone could perform on a motorcycle. "They used to put lions in the dromes, and the lions would chase the motorcycles," Pelaquin said. It's true. Her father performed in such an act, and she has photos of the lion drome to prove it on her website, wallofdeathonline.com. She runs the site to preserve the history of motor dromes, which have all but disappeared from this country. Pelaquin says only three remain in the United States, and two of them are in Sturgis this week. We live in a sad world when Kevin Costner can receive $10 million for making "Dragonfly,'' but there isn't room on the entertainment menu for an act with lions chasing motorcycles as they drive around on a wall. Hey, check out the background: A few folks in Sturgis are actually driving cars. "My father was a diabetic, and he got very sick a couple years ago," Pelaquin said. "He told me the saddest thing in the world for him was the thought that there wouldn't be any more motor dromes to see. I told him that as long as I'm alive, there will be." How big is the Sturgis rally? "It has grown at least 10 times since I came the first time, which was 1983 or 1984," said Tom Tinker, a retired sheriff from Springfield, Ohio. "It's getting too big, really." A teenager working the pump at the gas station said Sturgis residents are about split on the rally. They love the money it brings into the area -- an attractive waitress at the Full Throttle saloon can make $1,000 a night in tips -- but by midweek they hate the bikers and wish they would just go home. The vendors pose another problem. They make so much money during the rally that several wound up buying many of the downtown businesses just to have the storefronts available for this one week. That leaves residents with a downtown that is barren the entire year except for one week, when it is devoted to leather, alcohol and tattoos, and is too crowded to enjoy anyway. Eventually though, the rally ends and everyone goes home. Within two days, the town looks as if it was hit by a tornado, with street after street littered with the sort of garbage and rotting food seldom seen outside the back seat of my rental car. How big is the Sturgis rally? To gain a better idea of the rally's immensity, I took a walk through Buffalo Chip, which is out past the Full Throttle next to a frontage road. Make sure to remember where you parked your bike. The camp goes on for acre after acre, with tents and RVs filling every bit of available land. I walked up to one group of bikers who were grilling sausage and enjoying the stars filling the South Dakota sky. And to think I was disappointed when I was too late for Evel Knievel week in Butte, Mont. I laughed when I heard the guys at Buffalo Chip tell the story, but then I thought about the conversation I had with Pearl Gulbranson, who was working at the Crisis Intervention Center for domestic abuse, which is located in a house across the street from the Broken Spoke. Gather 500,000 people in one spot, feed them a lot of alcohol and there are bound to be some serious problems. "We average three or four 'contacts' a night," Gulbranson said. "And a lot of women get abandoned here. They get left behind with no way of getting home. So we're here to help." That's an important thing to bring up, but I guess it isn't a very nice way to end this story. Bikers flock to the rally from all points of the globe. And so, I think it's probably time to make a confession. I've never driven a motorcycle. I've only ridden as a passenger on the back once, and that was when there was absolutely no other way for me to get where I needed to go. You see, former Minnesota Viking Karl Kassulke was one of my favorite players when I was a kid, and when he was paralyzed from the neck down in a terrible motorcycle accident, I lost all desire to ever ride one. And I never have. When I reluctantly admitted this to bikers, they shook their heads in disbelief. Clearly, I'm missing something. "It's the freedom that I love," Tinker said. "Not here, where it's too crowded, but when you can really get out there on the road and ride. It's just you and the bike and the road. Wherever you go, you're a part of the environment. You're not sitting in an air-conditioned car. You feel the weather. You can feel the temperature change. And if it rains, you get wet. But you dry off as quick as you got wet." There are other huge motorcycle rallies -- Daytona, Fla., holds two of them -- but what makes Sturgis special, bikers told me, is Sturgis itself and the land surrounding it. "In Daytona, you're in a big city with a lot of cars and there isn't much to see," said John Graham, a ship captain. "Yeah, there's the ocean in Daytona, but I like it here a lot better. You can get out and ride, and it's beautiful. The scenery is the big thing for me." "It's like that saying, 'If I have to explain it to you, you won't understand,' " said Masal, a lawyer from Mobile, Ala. "That sounds trite, but it's true." It's like what Diego Sandoval told me. He lives in Costa Rica, where he owns a motorcycle shop. This is his first visit to Sturgis, and he says he'll be back. And next time, he wants to build a motorcycle so he, too, can drive these roads. "In my country, the roads are too narrow," he said. "Here, it is a great place to ride. Everything is so wide and open." How big is the Sturgis rally? As big as the country itself. Jim Caple is a senior writer for ESPN.com. He can be reached at cuffscaple@hotmail.com.